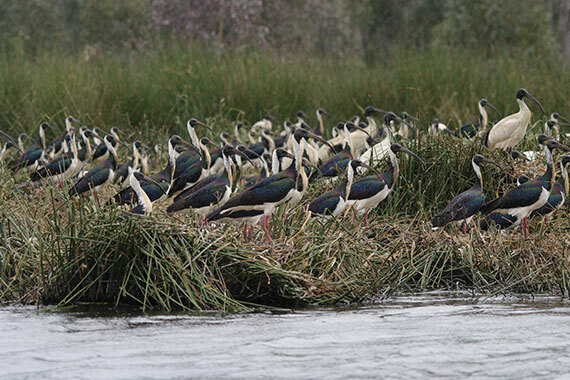 Environmental watering of wetlands in the Central Murray region attracted more than 60 species of waterbirds in 2014–15. Environmental watering of these wetlands takes an integrated landscape approach, which considers the watering requirements of individual wetlands and the interactions that occur regionally. Watering in 2014–15 focused on supporting the endangered Murray hardyhead, promoting the health and recruitment of native plants, including river red gums and aquatic species, and providing feeding and breeding habitat for native waterbird species. Heidi Kleinert, Project Officer with the North Central Catchment Management Authority, said, as in previous years, the number and diversity of waterbirds at six wetlands in the Central Murray region improved significantly as a direct result of environmental watering. "Waterbird monitoring funded by the Victorian Environmental Water Holder detected the presence of 18 species of waterbirds that are listed as rare or threatened," Heidi said. "Of particular note was the presence of a high number of the threatened blue billed duck and freckled duck at Round Lake, along with sightings of the iconic brolga by members of the community at Lake Murphy and Johnson Swamp." Monitoring also indicated an increase in the density of aquatic vegetation at Lake Elizabeth, and an improvement in the health of river red gum and lignum communities at Wirra-Lo wetland complex and McDonalds Swamp.